Of course, this only starts to answer the many questions that exist with this storm. Here's a breakdown of the major topics, and what we know at this still-early juncture. The area of greatest snowfall - truly epic and historic amounts - almost assuredly will be found in the Appalachian Mountains and the suburbs just west of Washington, D.C. In these locations, snow begins later Friday and continues through Saturday, and somewhere around three feet can be expected. Farther north, into Southern New England, the greatest snow will come with a burst of warm and moist air extending northward in the middle levels of the atmosphere, several thousand feet in altitude, that will expand from south to north on Saturday. 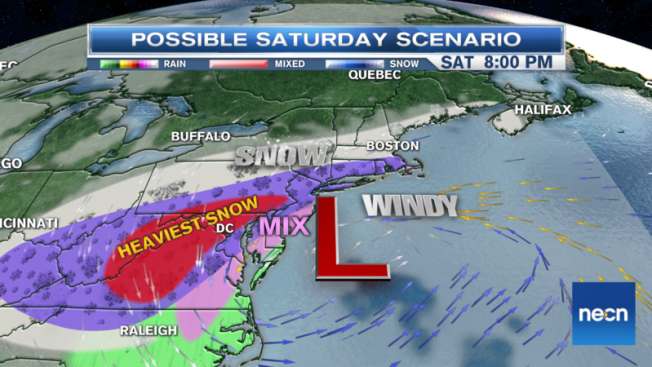 Timing of snow arrival to New York City and New England are still not set in stone, but a likely arrival of Saturday morning to NYC, Saturday midday or early afternoon to the South Coast of New England, and later Saturday through most of the rest of the southern half of New England seems most likely, continuing Saturday overnight and departing the first half of the day Sunday. Farther north, a clip of the northern edge of the snow shield is possible along the coast of Maine (35-45% probability at this time) but the North Country is not expected to see a significant impact. An early estimate? A larger collection of reliable precipitation estimates will arrive with the night runs tonight as we get within three days of the event end, but for now I wouldn't be surprised to see greater than six inches in Southern Connecticut, Rhode Island and Southeastern Massachusetts with the potential for a foot, 4-6" somewhere near the Massachusetts Turnpike and 2-4" in Northern Massachusetts - but again, it's really early in the world of snow forecasting and we haven't put this on a map yet, as we really want to get inside of that three day window of storm end. Always remember that, regardless of source, accuracy on snowfall forecasts decreases markedly outside of 24-30 hours. From the Delmarva Peninsula northward up the East Coast through the South Coast of Connecticut and through Cape Cod and the Massachusetts Islands, gusts of 50-60 mph will be possible from the northeast. This will result in scattered power outages and tree/limb damage from the Mid-Atlantic to far Southern New England, but also raises the potential for blizzard conditions to be realized where heavy snow and strong wind intersect - particularly in Central/Eastern New Jersey to Long Island. With the strong onshore wind comes the potential for coastal flooding. In fact, at least minor coastal flooding is probable from North Carolina northward through Eastern Massachusetts with this storm, with moderate coastal flooding quite likely along the Jersey shore. The time of greatest coastal flood concern for most of the Mid-Atlantic is Saturday evening, though in New England, the greater concern may come for Sunday's midday high tide, after some possible coastal flooding at typically vulnerable spots Saturday night around midnight. Of course, these forecasts will become more refined as we near the storm's arrival. We'll keep you posted online and on NECN.